by Dr. William Pierce THE MAN MOST directly responsible for the demise of the British Empire and its replacement as a world power by the Soviet Empire is Winston Leonard Spencer Churchill (1874-1965). The policies which he advocated as a member of the British government in the period just before World War II and the policies which he followed as prime minister during that war were diametrically opposed to the interests of the British people and led ultimately to the sad plight in which Britain finds herself today. Churchill acted as he did, because he consciously and deliberately served alien interests from 1938, at the latest, until the end of the war. 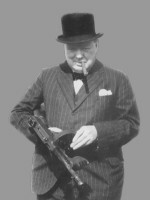 Winston Churchill was the descendant of a . . .
Continue reading The Buying of Mr. Churchill . . .
by Dr. William L. Pierce At the end of World War II one of America’s top military leaders accurately assessed the shift in the balance of world power which that war had produced and foresaw the enormous danger of communist aggression against the West. Alone among U.S. leaders he warned that America should act immediately, while her supremacy was unchallengeable, to end that danger. Unfortunately, his warning went unheeded, and he was quickly silenced by a convenient “accident” which took his life. On the 69th anniversary of General Patton’s death, we are proud to republish this essay from William Pierce’s Attack! newspaper. THIRTY-TWO YEARS AGO, in the terrible summer of 1945, the U.S. Army had just completed the destruction of . . .
Continue reading General Patton’s Warning . . .
by Dr. William L. Pierce Alexander Solzhenitsyn: Henry Kissingercontemptuously described the red-headedRussian literary giant as “to the rightof the czars.” WHEN ALEXANDER SOLZHENITSYN, the Russian dissident writer who was exiled by the Soviet government in February, recently shouted at a group of Western newsmen, “You are worse than the KGB (Soviet secret police, equivalent to our FBI),” they were understandably hurt. After all, had not the newsmen of the democratic West made a great folk-hero of Solzhenitsyn, praising him to the skies at every opportunity? Had they not publicized his books for years, leading to their widespread sales outside the Soviet Union — and to a Nobel Prize for Literature for him in 1970? Khrushchev Goofed Too Alas, the . . .
Continue reading Solzhenitsyn and the Liberals . . .